Based on Sections 10 and 24 of the Personal Data Act (523/1999). 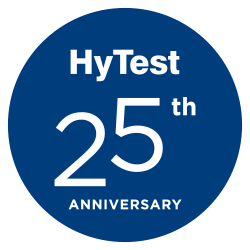 HyTest Ltd. offers solutions for assay development and research applications by providing high-quality immunological reagents in such areas as cardiac markers, markers of metabolic syndrome, infectious, neuroscience, autoimmune disease, and veterinary reagents. Email address and details on where to send the rectification requests. HyTest Ltd’s line of business is IVD raw materials producer. HyTest Ltd. customer data file contains the contact data of the company’s customers and also potential customers. The customers are private, public or third sector organizations. The data subjects are employees or responsible persons of these companies. The data is processed for providing the agreed products and services to the customer, invoicing, managing and improving the customer relationship. The data is also used for statistical purposes. The data is also used for advertising, marketing, direct marketing and targeting marketing content to customers. However, identification data in communications is only used with the customer’s consent. The customer has the right to prohibit direct marketing targeted to them. Furthermore, the controller uses the data file for ensuring the data subjects’ right to be informed and the right to inspect their own data. HyTest Ltd. reserves the right to remove any data it deems unnecessary from the data file. The data file only includes data and contact details of persons who are current or potential customers of HyTest Ltd.
No data from the data file is disclosed to outsiders. The data file is maintained at the controller’s facilities with appropriate security and access control systems. The prevention of misuse and intrusion attempts is implemented with technical and application solutions of various levels. The data banks are backed up appropriately. All login events can be verified with a personal user name and password. HyTest Ltd employees have a restricted right to process the data in the data file. The processing rights are limited to service maintenance and administrative tasks. Each data subject has the right to inspect the data concerning them in the register. The related request must be submitted in writing to this email address dataprotection@hytest.fi. The data subjects are informed of the processing of data by making this privacy notice available at the company’s premises and on its website. The controller shall, at its own initiative or at the request of a data subject or the data subject’s employer, erase, rectify or complete any inaccurate, unnecessary, incomplete or outdated data without undue delay. The related request must be submitted in writing to this email address dataprotection@hytest.fi. With regard to the rectification, completion or erasure of data, an essential aspect is the purpose of using the data, which is managing the customer relationship. The data subject has the right to prohibit the processing of their data for the purposes of direct marketing, profiling, distance selling, marketing, and opinion research. The related request must be submitted in writing to this email address dataprotection@hytest.fi. No data is disclosed from the data file. In case any data is transferred outside the European Union or the European Economic Area, the transfer requires that the destination country ensures an adequate level of data protection or the controller provides, with contractual clauses or by other means, sufficient guarantees to protect the privacy and rights of individuals or the data subject has given their explicit consent to the transfer.